Speaking of giant: what are those things resembling giant cobras peeping over the parapets ? Mr Crown, sir, architect: aren’t all those totally function-less urns around the top and doors in the middle that go nowhere, etc. — all those decorative touches that serve no purpose — one of the hallmarks of classicism? Or maybe that’s just Stalinist classicism. No, absolutely. It’s not just Stalin, they’re present in the old-fashioned kind of Roman & Renaissance classicism too. After the 18th century, and the closer you get to the present, the less likely big buildings are to conform to the rigid proportioning of the five classical orders, though. So the things that look to be like cobra heads (especially around the top of the building section in the background) are actually urns ? What’s in them ? Or are they called that simply because Tadjiks urn a living by working up there ? Sorry, I just can’t help myself. Are we talking about the sort of knobs along the edge of the roof? Now I am thinking of (a) the sharp pointy bits that you see strategically affixed here and there on ledges and protruding beam ends to keep birds from sitting around — I mean, so that they don’t mess up the entrance area or the people’s heads with their droppings and (b) the bits of glass that I have sometimes seen incorporated into the tops of low walls between someone’s front yard (BrE garden) and the sidewalk (BrE pavement), presumably to prevent people from sitting there. Maybe someone was worried about giants sitting on the roof? They don’t look like chimneys, but could they be some kind of vents? or are they too close to the edges to be functional? You can see them better at the top of the last-but-one post. You guys have been brainwashed by functionalism; some of us, like me & Stalin, still think that you can place an urn on top of a building without it having to “do” anything. Ideally I suppose it should contain floral decoration. To my defence: I never said that the building seemed older than our host. But seeing it (the building) from this distance and angle it’s clearly Stalinist. I didn’t expect it to come with that level of detail in its faux-historisism. Neither did I, it’s a big surprise to me too. But let’s face it, most historicism is faux; none of us wants the truth from our architecture parlante. In the penultimate post, I see that those things are not urns, but petrified flying saucers pretending to be decorative seashells at the instant of take-off. I spurn your insinuation of being in thrall to functionalism. The architect has no one to blame but himself when what he bolts to his buildings remind people of functional objects. To clarify his intentions, he should put up signs. Magritte showed the way: cela n’est pas une urne. Or did you mean the antepenultimate post ? I thought it was a bit vague, which is why I linked to it. But it IS an urn. What’s a Greek urn? About 50 drachma a week. I love all the urn jokes. Youse guys! There are also large granite balls between the two houses, but I’m afraid of the puns a photo of them would reap. Mr. Crown knows his function-less decorative classicism. Those knobby things on the top are indeed urns, but I don’t think they are actually concave. There are also decorative bas reliefs at the top — you have to understand that this building is outside my study window, so I stare at it about 15 hours a day — which drive me nuts because they are at the top and I can’t make them out. My guess is wheat (we liked wheat decorations in the Stalinist ear), but I need binoculars to make them out. 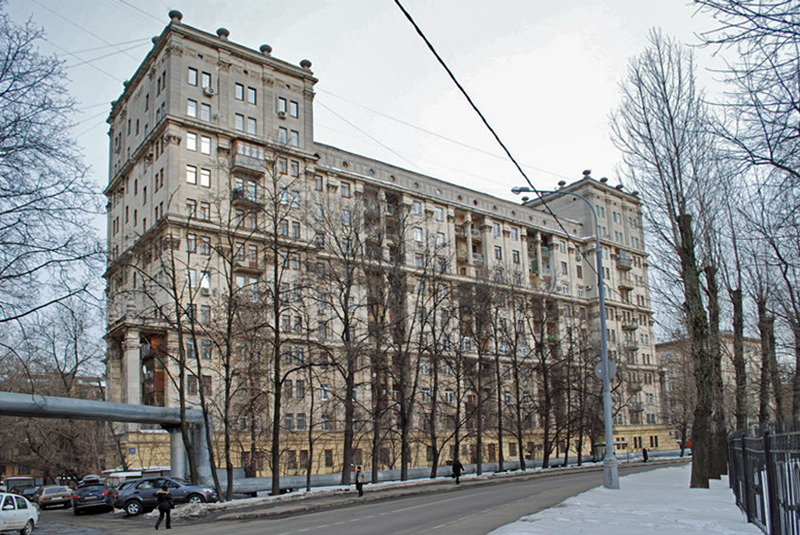 The bad thing about classic Stalinist buildings, especially the ministry ones, is that the doors are about 25 feet high and human beings feel like ants when they go in them. There is a “the state is majesterial; the peons are not” vibe. But 1) the workmanship is excellent 2) the ceilings are high 3) even if they are boring (at times), the symmetry and proportions are pleasing (or at least not jarring) and 4) they fit in nicely with the other architectural styles. Well, that’s my take. Mr Crown and other people who actually know something about architecture might disagree. I’m sure I agree. When I lived in Hamburg a local architect explained some interesting subtleties of the local nazi public buildings; for instance they have the enormous doorways, but you cannot approach the entry in a straightforward way, there is always some device to block it so you are obliged to scuttle round to the side and creep in crablike. He explained it in the same way, that the state is overwhelmingly powerful and you are puny. I may have missed it, but what purpose does the building serve (and did it serve) ? Ministry, or apartments for high-level bureaucrats, Party types? That would explain (to me) the detailing usually absent in Soviet brutalist architecture. When I thought of Magritte’s ceci n’est pas une pipe just now, it occured to me for the first time what the point of it was: “it’s not a pipe, it’s a picture of a pipe, silly !”. Am I behindtimes, and everybody else already knew that ? This building, and the one next to it that I live in, were built by the Ministry of Defense. They are rather modest, so I don’t think they were for the very top people. First through the magic of propiska (the piece of paper that gave you the right to live somewhere), lots of distant relatives moved in. And then through the magic of the invisible hand of capitalism, running dog imperialists like me moved in. Actually, I discovered the buildings were under the MOD well after I bought my place. In the early 90s people could privatise their apartments and sell them; it didn’t matter who originally financed their construction. (Each ministry had hundreds and thousands of non-ministerial properties: rest homes, vacation hotels, nurseries, hospitals, stores, factories… part of perestroika — remember that? — was getting rid of that stuff, so that the Railway Ministry only had to worry about the railway system and not two dozen chicken farms outside of Irkutsk.) About two years ago the buildings were taken off the books of the MOD and moved to the city. Since the Ministry knew this would happen eventually, they stopped serious upkeep years ago. The city is now responsible for fixing the leaking roofs, crumbling facades and balconies. There was that story in the ‘eighties that the US Defense Dept was paying $700 for a toilet seat, so if it was the same in Russia, maybe they felt they were being overcharged for balcony repairs. GS Am I behindtimes, and everybody else already knew that ? Art isn’t your best subject, Grumbly. But you excel at maths which is far more useful and I’m envious. I think the problem was that there was no longer any money in it. In Soviet times, a ministry would get budget money to build something. Now that was money you could play with! They didn’t actually cover their upkeep costs in rent; that money also came from the state budget. Then the state budget money went away for that sort of thing. Because individual residents could privatise their apartments, there wasn’t money there either. I’m not sure if they were compensated when the building changed hands, but in any case, they were glad to get rid of it. Other properties are more lucrative when sold. Can’t you grow things up your metal pipes? Wisteria would be nice. When my mother (born 1914) was in primary school, some of her classmates had lost their fathers in the war. But one girl had a special daddy: un papa en papier – a photograph of her father, which she long thought was her father. Poor thing, but how interesting. My daughter had a school friend who maintained that the earth was flat, having seen no evidence to the contrary. A wonderful anecdote, marie-lucie. It’s good that the girl had a father at least for a while, until some intellectual told her: ceci n’est pas papa. 99% of what we concern ourselves with is invisible, impalpable, inaudible, scentless and impalatable. It’s called reality. It reminds me of Oslo Havnelager. As it happens the Norwegian Defence Estates Agency are among the tenants. This might have been a good time to introduce some fresh photos from its new neighbourhood, the boomtown of Bjørvika. Why do defence bureaucrats need so much space? 99% of what we concern ourselves with isunquantifiable. It’s called reality. Because they’re defence bureaucrats. When you’re defending yourself, you don’t want to be backed into a narrow corner. Rather, you want a lot of space to maneuver in, so that there are many directions in which you can run away – to recoup or for good. Was the wisteria comment directed to me? I’m lost in the unreality of this thread. I don’t think we can grow wisteria here; isn’t it too cold? Can you grow it? I’d hoped to put in a forsythia bush at the dacha, and even that is iffy in Moscow. Some people grow wisteria here. There’s a Chinese variety which is quite hardy. The problem I had was that it started to come out and then we had some surprise snow in May that killed it off. So perhaps you (pl.) would be better off planting another lovely climber like a clematis or morning glory (“Jim”, who makes comments at Language Hat, thinks morning glory is a weed; he has dreams about it*, the silly paranoid man). Morning Glory is a weed almost everywhere I’ve ever been. The purple variety grows rampant here and I always think I really must find out how to get the LSD out of the seeds. Sorry for crossing threads here. We don’t like to think of it as a weed. Or rather, if that’s a weed then thank god for weeds. Ground elder though is in a completely different category, namely “weeds I do quite reasonably feel very threatened by and have nightmares about”. I will resist the temptation to edit the nightmarish wiki article on ground elder. It recommends spelling the name ground-elder rather than ground elder to avoid confusion with elder. Too little too late, if you ask me. It also says that The plant is said to have been introduced […] into Northern Europe by monks. Crown, you said that coal in the Wellies helps you manage your fear of badgers. Does that help with the ground elder at all? Though it adds confidence the coal in our wellingtons has never been put to the test however, I’m fairly sure it doesn’t simply ward-off badgers like a magic spell. Some people put the young leaves of ground elder–which I don’t think ought to be hyphenated, I’m not ever confused–in salads. Maybe this was what the monks did. At this stage in our relationship the very smell of it makes me qualm, though I do occasionally put borage flowers in salad (if I can find any). Wisteria or wistaria can grow so fast (in the right climate) that it’s a bit scary. 1. Wistaria was named after a man named Wistar. I don’t know how he pronounced his name. I’ve met someone of that name who says “Wister”. 2. No matter how you say the man’s unstressed second syllable, it won’t be a great help in pronouncing the plant’s stressed second syllable. So you just go according to the spelling and say something that sounds like “wistairia”. 3. So then people hear the word, which (at least in some dialects) rhymes with “hysteria”, and naturally they start misspelling it “wisteria”. This misspelling proves to be as robust as the vine itself. 4. So then people see the word spelled that way, and some of them start pronouncing it to sound like “wisteeria”. We don’t have that problem in French, where the vine has a very nice name: la glycine. Well I get 150,000 for -aria and 2 million for -eria, so I’m sticking with the majority. I used to comment on a UK gardening blog under the name of “Wisterious”, but my big decision there was whether it should have an I from wisteria or a Y from mysterious. I’ve never had the problem of it growing too fast, or even of it growing at all after my one attempt died. There are some lovely ones in London and New York growing up the fronts of houses. It’s my favourite vine. I do pronounce it wisteeria, but then I also say hysteeria. Do you say golf or goff? I try to say goff, but I think I’m more of a golfie type. I grew up pronouncing golf and gulf identically, but later decided that it was more genteel to give golf a different vowel. I definitely pronounce the /l/. I know a minister who pronounces miracle ‘mairacle’. But I don’t think he believes in them. We have wisteria growing up the front of our house. Unfortunately, it has taken more than a decade after an overzealous contractor’s single day’s work for the flowers of only one of two varieties to just begin to reappear. How lovely. Do you have both Chinese and Japanese or two versions of one? I say hysterical. Golf’s apparently some sort of class shibboleth in Britain, but the word never cropped up during my childhood. Luckily it hasn’t much since. I think ministers of the church should set out to pronounce certain words without distracting the congregation, it’s a bit like architects who mix up lentils and lintels. It occurs to me that midwesterners who have the same pronunciation for pin & pen may do this. We seem to be having an early spring here in Nova Scotia: today I saw the first flowers on the ground: snowdrops. There are already flowers on the forsythias in some areas of the city. This flowering seems to be at least one month ahead. Meanwhile students celebrating St Patrick’s Day were out in shorts and green t-shirts. All that is incredible, and I am afraid that there will be more snow in the next weeks. I’m very envious of you both. Scillas are lovely. I transplanted some into our garden when someone nearby was building on top of them and they survived. Now we have them. We get scilla in our neighborhood, too. I’m looking forward to seeing it soon. Scilla is also called squill. Confusingly, so are some kinds of mantis shrimp. I was once attacked by one of those monsters — well, fair enough, I startled it in its burrow on a sand flat in the estuary. I have never seen Charybdis, though. You’re on a seafood roll with this and the crayfish, though this looks more like a bunch of radishes to me. Oh, the scillas are beautiful. I wanted to photograph the first flowers I’ve seen hereabouts, but my blinking camera decided to buzz (something to do with the Sony integral “steadicam” feature – won’t even go away if you turn “steadidam” off. Don’t buy one.) so I couldn’t. Now it’s charging. I’ll be back, she threatened. The oldest wisteria in Britain, dating from, IIRC, 1817, grows up the front of the offices of Fuller’s brewery in Chiswick, West London. The brewery is very proud of the fact that its wisteria is older than the one at the Royal Botanical Gardens, Kew. I used to live in a house in Twickenham with a (purple) wisteria pergola: the colours of the flowers were wonderful, but almost better was the scent, beautiful and delicate. It had to be hacked right back to bare branches every autumn, but it would grow with great vigour every spring. Was there anything in Twickenham to remind you of that well-known rugby player Alexander Pope, who apparently resided there? Here are the Twickenham posters. 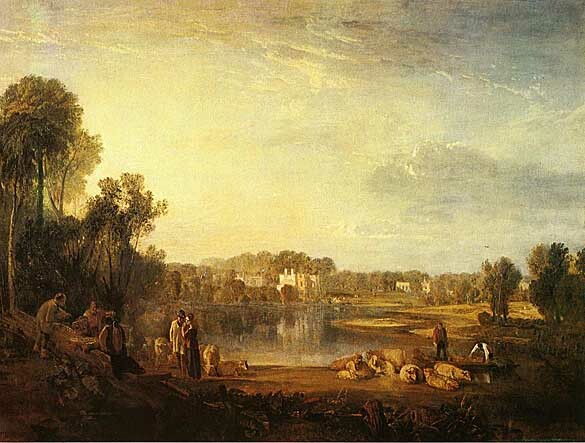 I see there’s a Turner of Pope’s Villa at Twickenham. I like this rugby one. I didn’t know what scilla was called in German, so I looked it up: turns out one of its names is little blue star (Blausternchen), so much cuter. Beautiful pictures of scillas, a flower I don’t remember having seen before. Many of them say “siberica”, which suggests that it likes a cold climate, is that right? Yes, they grow here, m-l. The ones I transplanted were wild, but I’m sure you could buy some bulbs. They’re lovely. I’d be surprised if they don’t grow in France, they certainly do in England. There is a pub/hotel by the river at Twickenham, in Cross Deep, just down from where Pope’s house stood, that used to be called the Pope’s Grotto and is now the Alexander Pope. Pope was rude about beer, and I’m afraid this rather colours my opinion of the unpleasant poisoned dwarf, however good a poet he was. Telephonic trivia: when London had ‘named’ telephone exchanges, one of Twickenham’s (alongside TWIckenham) was POPesgrove (as one of Hampstead’s was KEAts). The numerical equivalent of TWI, 894, still occurs in Twickenham telephone numbers, but the numerical equivalent of POP, 707, was assigned to Feltham. A “Feltham facelift” is an alternative name for the Croydon facelift. Are you serious, they gave 707 to Feltham? It’s right by Heathrow airport. Croydon is near Gatwick, so I suppose F. & C. ought to be similar. The Pope is apparently a big fan of Bavarian beer. Well, the pope is from Bavaria, so liking the local beer is practically mandatory. AJP, what makes you think that Descartes was a dwarf? I’m not sure where “dwarf” kicks in. I admit I’m fighting an uphill battle with Descartes. Pope was 4′-6″, I read recently, that’s … 137 cm. He had an illness: tuberculosis of the spine, they think. I recall that Descartes was around 5′-0″, or … 152cm. Shortish for a man, even in the seventeenth century, I’d say, though other dwarfs may not agree. Actual heights of the rich and famous is a bit of a minefield. According to Wikipedia, Napoleon was 5′-7″, or 170cm–“average height for the period”, it says–and yet who is going to believe that today, after 200 years of propaganda to the contrary? Not me. Descartes and Napoleon were good at maths, but don’t draw any conclusions from that; Empty is pretty tall. I understood this from something he said about trying to fit himself into a small car. Pope was a hunchback, which made him appear shorter than whatever he would have been with a straighter spine. I am sure Descartes (who was a career officer for many years) was not a hunchback. Time and again, in older French novels, you read the description un grand gaillard de cinq pieds six pouces “a tall strapping guy, five feet six inches tall” – obviously 5’6” was above the average height of men at the time, perhaps comparable to 6 feet nowadays. I never learned the height of Napoleon, but he was supposed to be on the short side, so 5’7″ seems to me to be too tall for him. My parents were respectively 1,70 m (my father, “tall”) and 1,69 m (my mother, “very tall”) when they got married in 1938 (they shortened with advanced age). Only one of their daughters (not I) is taller than her parents. Many people in France, of both sexes, are much shorter than that. In Paris there is a military museum in the Hôtel des Invalides (which is not a hotel but closer to a palace), which among other things (such as Napoleon’s tomb) has a collection of suits of armour, especially ceremonial ones, made to measure for famous soldiers, sometimes a long time after armour was actually useful in battle. It always surprises visitors to see how small they are. Similarly, in some museums there are clothes, especially women’s gowns, many of them known to have been worn by well-known persons. Again, many of them are tiny (I remember seeing some of Empress Joséphine’s gowns – she was certainly under 5 feet tall). Exactly the same height as my parents, with similar descriptions from my mother. When I was a child, I thought of her as very tall. Now she is dwarfed by my daughter, who is 5′-9″. I remember being surprised by the tiny suit of armour made for Charles I, now it’s in the Tower of London. I’m not so very tall. I fit into the car in some sense, but I didn’t think I would want to buy it and then spend thousands of hours in it over the next few years if its roof was making me feel the least bit intruded upon. In my prime, I was a bit over 6’2” (something like 1.89 m). Exactly the same as my father. Exactly the same as my father’s father. I am shrinking a bit now, and my son has surpassed me. It hadn’t occurred to me that I might have started shrinking. I wonder if my feet will shrink or if I’ll be very short with huge feet. I believe Language may be as tall as you. The European suit of armor in our front hallway is about as tall, comb to sabatons, as marie-lucie’s parents. The samurai armor in our parlor is smaller, but it’s harder to say exactly how tall the wearer would be. When I shrinking I mean settling vertically. My feet are bigger than ever, not just in proportion but in an absolute sense. I saw Josephine’s bed at Malmaison and it was quite short. But they told us in those days people slept sitting up in bed because they believed it was unhealthy to sleep laying down. The shortest person in my family (not me) is 5’6″, I’ve heard Americans are growing much taller than in previous generations because of good nutrition. Milk was really big back then. We were practically force fed five glasses of milk a day. My tallest uncle told me he got that way by drinking milk. I was dubious so I waited a few years and asked the same question, got back the same answer. But when I grew up I asked him about it again. He didn’t remember giving the answer but said it was not true, only something to tell children to get them to drink more milk. I believed him the first two times. Yes, for a time, Americans were the tallest. But they have been outpaced by the Dutch. It’s a good thing the Dutch don’t have to wear their parents’ suits of armour. It turns out that Americans — literally — are not standing as tall, compared with the rest of the world, as they used to. Tall is good if you have high bookshelves, though long arms serve just as well. Octopi should make good librarians. Tell that to the Librarians’ Union. How tall you think Americans are depends on where you go. When I go back to visit Minneapolis I always notice some subtle difference in talking to people, and later realize it’s because I’m talking eye to eye with them, or sometime even looking up. In Chicago I have to look down; most people are at least a head shorter than me. When growing up in France, I was always considered tall, but on this side of the Atlantic I am the average height for North American women. When I go to France I am still on the tall side, and I am always surprised by how many men (and of course women) are definitely shorter than I am (although many are definitely taller too) and I have to look down at them.